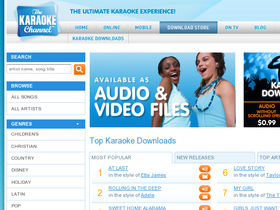 Visit The Karaoke Channel online at TheKaraokeChannel.com where they believe karaoke should be easily accessible by everyone, anywhere and they are pleased to deliver karaoke songs Online, on TV and for Download with many media devices. The Karaoke Channel delivers more than 18,000 professional quality karaoke songs in English, French, Spanish, Dutch, German and Italian. The Karaoke Channel's diverse library contains songs for every singer, from Pop to Country to Hip Hop, just to mention a few different genres. Save on your next purchase from TheKaraokeChannel.com with The Karaoke Channel discounts, The Karaoke Channel promotions, The Karaoke Channel coupons and The Karaoke Channel savings from 58Coupons.com. Buy 12 or more songs on TheKaraokeChannel.com and you can save 50% off your order with this coupon code. TheKaraokeChannel.com is now offering a buy 6, get 6 free promotion on songs. Use coupon code to save. Check out TheKaraokeChannel.com and you can save 15% off your order of $6 or more with this coupon code. Click link. Right now when you sign up for a Superstar membership on TheKaraokeChannel.com you'll save $40. Act now to enjoy 53 Free Songs from TheKaraokeChannel.com with a Free Trial Membership.